NEW ORLEANS – After a runaway win at the SEC Outdoor Championships, the Florida men are the new No. 1 squad in the National Team Computer Rankings announced Monday by the U.S. Track & Field and Cross Country Coaches Association (USTFCCCA). As impressive as the Gators’ 130½-95-95-92 victory over Texas A&M, Arkansas and LSU was this weekend, the USTFCCCA computer projections portend a much, much closer competition at the NCAA Division I Outdoor Championships In Eugene, Oregon, on June 10 & 12. Only two points separate Florida (316.25) from Texas A&M (3:14.67) as the rivals find themselves on a nearly identical trajectory to 2013 when they ended the season as co-national champions. 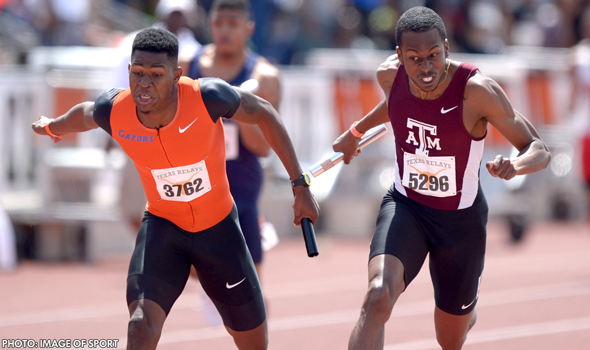 Only four points separated them at this juncture – less than two weeks until the East and West Prelims – in the ’13 campaign after Florida topped A&M at SECs (though Arkansas was the overall conference winner that year). A reminder: the National Team Computer Rankings formula does not equate to the NAIA Championships scoring system. A full breakdown of the process can be found here. Back to the present, the Gators literally jumped up two spots, as the duo of Marquis Dendy and KeAndre Bates soared up the national leaderboard in the long jump. Defending national champion Dendy won the SEC title at 26-10½ (8.19m) – a career-best mark made even more impressive considering he jumped into a 2.4m/s headwind – to move from No. 11 in the country to No. 1, while Bates went from No. 28 to No. 6. The Gators have been ranked No. 1 at this point in each of the past two season, ultimately finishing second a year ago and earning co-champion honors in 2013. On the rise and looking to break up a 2013 national championships redux in favor of a 2014 repeat was Pac-12 Champion Oregon (293.14), which improved one spot to No. 3. The superstar distance trio of Edward Chesrek, Eric Jenkins and Will Geoghegan made their way back into the 5000-meter qualifying picture, but the Ducks’ biggest boost came from the sprints. Sophomore Marcus Chambers moved to No. 6 on the 2015 400-meter qualifying list with a Pac-12-winning 45.21, toppling his old career-best from a month ago by more than a second. Coincidentally, Oregon was also ranked No. 3 with a point total in the 290s in that aforementioned 2013 title chase. Down a spot to No. 4 but still very much in the race is LSU (279.41), which was edged in the SEC Championships standings by No. 5 Arkansas (211.59). The fifth-ranked Razorbacks, like the Gators, were boosted by a long jump national champion finding his form as 2014 indoor winner Jarrion Lawson climbed from No. 29 in the country to No. 4. The Arkansas 4×100 also factored in as it moved from No. 15 to No. 6 in the country. Teams that check in with 200 or more points have historically been strong contenders for one of the four spots on the team podium, and No. 6 Southern California is the last member of that 200+ club this week at 208.65, despite falling a spot to No. 6. Each of the teams through Southern California changed positions from a week ago, as did the remainder of the top-25 teams following the Trojans. No. 7 Georgia moved up two spots from a week ago, while SEC rival No. 8 Mississippi State was the biggest mover into the top 10 with a 10-slot improvement. ACC Champion No. 9 Florida State climbed six spots from a week ago, while Big 12 Champion No. 10 Texas made room for each of those teams by falling four notches. Other big moves were made by No. 20 Oklahoma State (up eight) and No. 16 South Carolina (up six). This week also marked the final regional rankings. Three new men’s teams finished the season at No. 1 in their respective regions: Big Ten Champ Illinois in the Midwest, BYU in the Mountain and American Athletic Conference Champion Connecticut in the Northeast. No new women’s teams rose to No. 1 in their regions.